Small 4 Style: The Face of Aftershock Contest 2013! The Face of Aftershock Contest 2013! Aftershock London swept us Dallasites away when they opened a flagship store at the Plaza at Preston Center in May 2013. 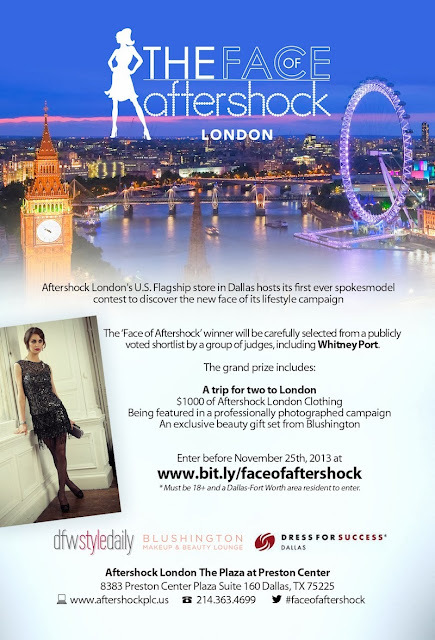 This fall, Aftershock London is kicking it up a notch with its "The Face of Aftershock" contest. One lucky Dallas stylista will get the opportunity to be Aftershock's spokesmodel and score some sweet prizes too. Big Dallas fashion names are judging, like Lisa Petty of DFW Style Daily. Plus, rumor has it that there will be a special celebrity judge, Whitney Port, joining the panel as well. All the information is below. To enter, just follow this link! Applications will be accepted until November 25, 2013.